The silence you hear after successfully unloading an entire volley of cannon fire into a now sinking enemy ship in HeroCraft’s latest release, Tempest ($7.99) , is euphoric. The only problem is that a stop in the action is guaranteed to be short lived. The pace and pay off of being a pirate captain may feel highly romanticized in this sea-worthy offering, but I approve. Any time a developer cooks up an ARPG that even seems half-baked, my ears perk up and this time I am really glad they did. This game taps directly into a whole lot of what makes the genre great and does it in a way that is original enough for you to sit up and take notice too. Tempest currently lacks a tutorial or anything that would function as an orientation. Upon loading the game, you are dropped directly in the water with your first ship and an interface that you have to explore for yourself. Although it takes a few minutes, there is nothing that is wildly counter intuitive as to what you have and what you can do. You have a crew, you have ammunition, medical supplies, assorted loot and ship enhancements of various types. Each faction has their own set of quests you can complete and most items you can purchase, including new ships, are only available at certain ports. You can upgrade your captain skills, the skills of your crew, or any equipment or ammo you use in combat. This game really feels like you have to jump into the deep end to figure out what it’s all about, and it has little to do with the lack of an introduction. Each of the game’s several factions has quests that unlock after reaching a certain reputation, and it is very hard to gain one reputation without losing some of another since just about everything you fight in game is associated with one of these factions. Even down to each quest you take, you don’t know if you will make money, lose money, or be thrust into combat with overwhelming odds. Even turning the difficulty all the way down does not guarantee you wont end up facing 2 or three ships that are comparable to yours in a single fight. I managed to find some quests with the Kingdom faction that allowed solid gold returns and had mostly manageable fights. Once you can establish a foothold and generate reliable income, the game opens up and affords you the luxury of exploring other quests and investing in new ships and new loot to extend your ability to conquer more unknown content. You won’t go wanting for eye candy in Tempest . 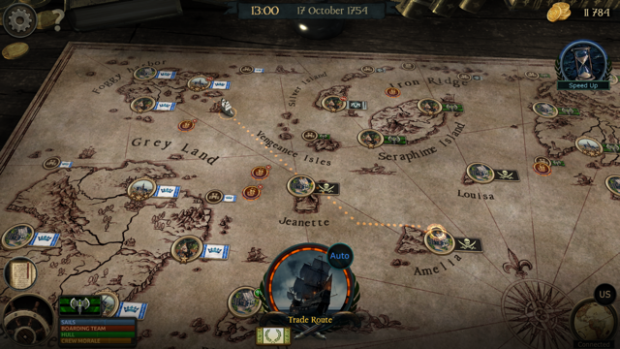 The world map that you traverse across is almost Tolkien-esqe and probably belongs mounted on a wall instead of spread across a captain’s table. The real pretty pretty comes in though when you go to war. Fighting is where the graphics really come alive and pull you into the experience full bore. While there are a few camera issues that sometimes require a re-position or to wait a moment for the transition from out of combat to in combat UI, the game feels like it belongs on a console and only made it to mobile because the controls just make too much sense. Turning and firing are an easy to learn groundwork for combat which become more nuanced when you start figuring in head winds, executing fast turns to fire from both sides of your ship and of course avoiding running into other ships(no the AI of ally ships does not care about you one bit). Once you find your bearings, you’ll quickly find the high point of this game is the real time ship to ship combat. The leviathans that you occasionally run into make for great end boss candidates and generally throw a whole ton of chaos into fights you might otherwise be able to manage without having to frantically dodge multiple times every minute. On top of ship guns that can only be aimed to the starboard and port directions, you can also find or purchase items that can be activated with the use of a mana-like energy bar that recharges when you dock at a port or sail for a little while. Movement and attacking are thankfully quite intuitive and once you can overcome the aforementioned camera positioning challenges you have very little to stand in your way of destroying the enemy. 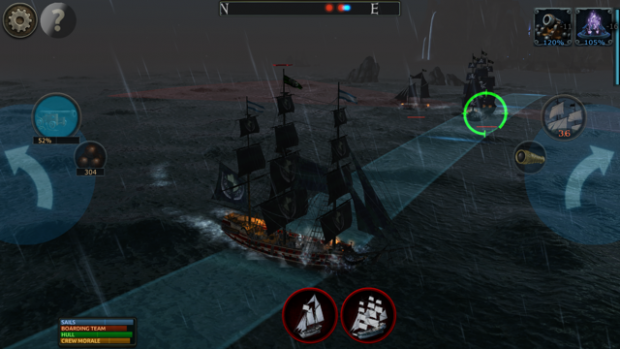 There are times you can board an enemy ship to plunder it and gain more than normal resources. This is a separate game mode and really does not make much sense to me. I have had my crew get completely overwhelmed even after reducing their crew’s strength, so I have decided to pretend boarding doesn’t actually exist in game and I feel better off for it. After you’ve sent a few shiploads of seamen down to Davy Jones’ locker, you’ll probably want to explore the different upgrade options available to you in Tempest . Ship choice is basically a sliding scale between maneuverable and durable. The more durable ships cost more but they are very much worth it. While you won’t be sailing quite as fast or as nimble as the smaller ships, the increased hull points(think hit points) are justification enough, but you usually also get an increase in firepower as well. My first ship purchase in game was a Frigate class ship that was slower and more sturdy than the starting ship. I was so happy with my purchase I slapped new paint on the hull and got some nice matching sails to feel a little more unique. Tempest may not have the loot depth of say a Titan Quest or , but it still holds to a staple of the ARPG genre in that much of your character is built upon what you equip. Sails, the wood of your hull, guns, cannons, even trinkets that you can carry on board all affect your stats and come with boosts that help you tailor how your fight. This is a very fun part of the game for me, shopping different ports for just the right gear is just the type of loot hunt every good ARPG needs. I wanted to mention that the game also has multiplayer but I’m not sure if it works. The interface is a little strange but you can opt to try to join or start a multiplayer room, but I have not had anyone join my game, nor have I found a game I could join. For the most part I have played and enjoyed the game as a solo experience, but could see a lot of potential if the multiplayer does indeed work. You don’t have to look close to see flaws in Tempest , but none of them get in the way of the fun either. What Tempest does well it does really well. If you ignore the loose ends and missed opportunities, you have a five star must play game. Even in its current incarnation, a few patches and an update could bring this game to the forefront of the app store. As it is, I have hope that we can see updates that could bring a real introduction, a fix to intermittent camera/graphical lag and a difficulty indicator per each fight or maybe some balance tweaks for certain fights(or boarding for that matter). With a number of tech updates already released, my hopes are high. If you keep in mind that the seas can be a little rough, you are going to have a whole lot of fun playing Tempest . This game is worth the investment.